Anchor: There is a flurry of diplomacy surrounding the two Koreas, the U.S. and Vietnam two weeks ahead of the second U.S.-North Korea summit in Hanoi. The top diplomats of South Korea and the U.S. are set to finalize strategies for the upcoming summit in Europe this week, while the Vietnamese foreign minister is headed to Pyongyang to prepare for North Korean leader Kim Jong-un's state visit to Vietnam. Report: Vietnamese Foreign Minister Pham Binh Minh will be in Pyongyang from Tuesday to Thursday, where he is expected to fine-tune details of North Korean leader Kim Jong-un's state visit to Vietnam before he meets U.S. President Donald Trump in Hanoi later this month. 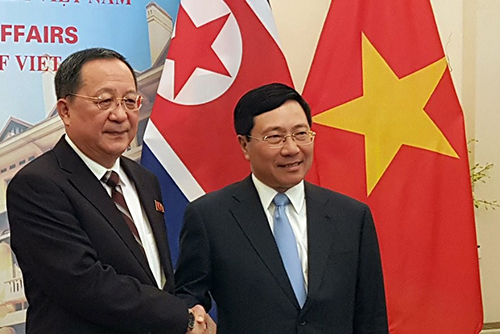 Minh, invited by North Korean Foreign Minister Ri Yong-ho, is reported to be accompanied by a ministry official in charge of protocol for visiting state leaders. It is speculated that the Vietnamese minister will discuss the nature of the North Korean leader's visit and details of his stay with his counterpart in Pyongyang. Both Pyongyang and Hanoi are seeking a win-win situation where they can maximize benefits from the upcoming summit. The North is seeking to highlight the symbolic significance of the summit being held in Hanoi, the city regime founder Kim Il-sung had visited twice and the heart of Vietnam's "socialist-oriented market economy." Vietnam is attempting to upgrade its international reputation and expand its geopolitical influence by hosting the summit. From Wednesday to Friday this week, South Korean Foreign Minister Kang Kyung-wha plans to meet her U.S. counterpart on the sidelines of international forums in Poland and Germany to finalize their summit strategies and discuss details of the summit agreement. Kang is expected to highlight South Korea's role in achieving a successful outcome from the summit and deliver the outline of Seoul’s hoped-for agreement involving Pyongyang's denuclearization steps and Washington's corresponding measures. These diplomatic efforts will be followed by the U.S. and North Korea's final working-level talks to draft the summit agreement led by chief negotiators Stephen Biegun and Kim Hyok-chol. The two sides will most likely hold those talks in Hanoi next week. At a meeting between U.S. Deputy Secretary of State John Sullivan and a visiting South Korean parliamentary delegation in Washington on Monday, Biegun was quoted as saying that the U.S. and the North have so far laid out what each side wants from the summit. As the two sides plan to focus on narrowing their differences in the next working-level meeting, Biegun said while it will be difficult to resolve all the tricky issues, there is a chance if they can agree on a timeline for denuclearization.